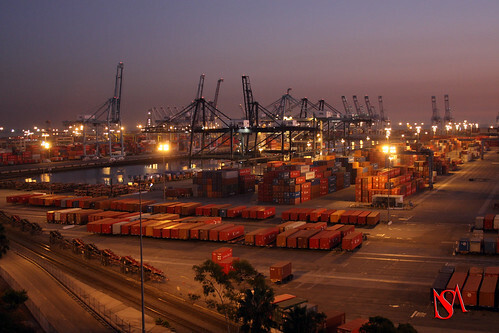 Next week I will be presenting our (with Nathan Huynh) paper on agent-based seaport container terminal simulation at the workshop on agents in traffic and transportation. Basically, we used netlogo to build a simulation of a container seaport terminal, like the one you see on the photo. We focused only on the decision-making process of the cranes. Those large cranes you see have to pick up the containers and place them on the trucks as they arrive. Since the cranes are slow and there are many trucks the crane operators have to trade-off several competing interests when making their decision: trucks want to get out of there as quickly as possible, it takes the crane a long time to travel the length of the seaport, the port manager wants to maximize the number of trucks served but without making any one truck wait too long. a mixture of the above two. Test results showed that the distance-based won, by a lot. It won not only on the throughput, as it obviously would, but also on the fairness measures, which is not so obvious. We are currently working on expanding this model, both from a programming, simulate more parts of the supply chain, and the analysis side, put some bounds on the solution quality that can be achieved assuming local control and local information. Excelent work. Could you please upload the NetLogo file?, I would like to explore the model. Yes, thanks for the reminder. I will be posting the code soon.